KXT radio (91.7 FM), the new music arm of North Texas Public Broadcasting Inc. (KERA), will launch on Nov. 9th, providing nine to 11 hours of weekday local programming. The announcement came Wednesday after Dallas-based KERA received official approval from the Federal Communications Commission to acquire the operating license. The 91.7 FM call letters currently are KKXT, but KERA has decided to subtract one of the Ks after initially trying to re-scramble them into a TX of some sort. "We tried to secure call letters that conveyed a sense of place, but everything with the combination of 'TX' was already licensed," KERA president and CEO Mary Anne Alhadeff said in a statement. "Yet, the reversal of the letters with KXT was different, and we liked that." The station will debut with the 7 a.m. locally produced KXT Morning Show and also will feature mid-afternoon and evening components. Local hosts and special program features will be announced later. An array of national programs also is on the schedule, most prominently UnderCurrents from 8 p.m. to 5 a.m. weekdays. 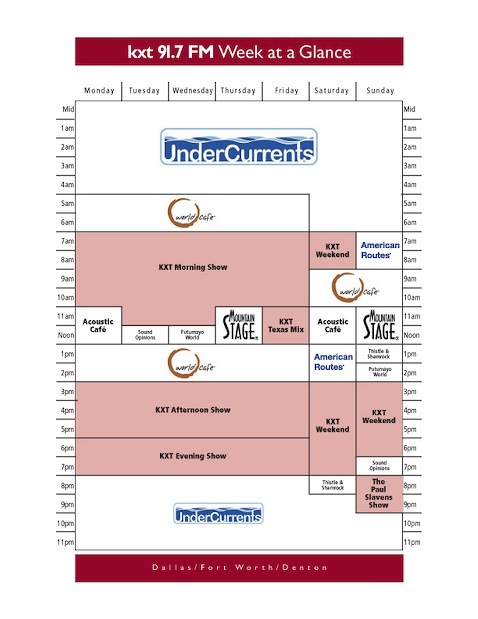 According to KERA's description, UnderCurrents "provides a thoughtful, yet playful free-form music mix: rock, folk, blues, reggae, dub, electronica, hip-hop, world and roots music." What, no polka?